I like this book because it stimulated an inner dialogue within myself. It shares concepts and practices about leadership and dialogue that have been used and are still used on the African continent. From my experiences it seems that in many African countries western ways of meetings, leadership, and dialogue have been adopted, which are often full of formal protocol, high tables, speeches, experts (from the west), round table conferences (with square tables and a formal set-up). I wonder why the African traditional gatherings and meetings, dialogue, providing leadership, have been pushed to the background, are forgotten by many as soon as they are in an organisational setting, while in tribal/clan meetings these traditions are still practiced. Interesting enough in the modern western literature on leadership and dialogue these old African traditions are very much present. 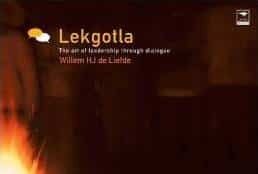 In my work I plea for a revival of Lekgotla (meeting circle – assembly) and the Kgosi (the natural leader) in organisations, companies, institutions and communities. This book is an amazing source for everyone who is is involved in leadership development, promoting dialogue and transformation. As mentioned in the foreword, the book connects two different ways of thinking. Social constructionists say that people in dialogue with each other give form and meaning to the world, which in this book is linked to the thinking behind systems theory. The latter states that reality is determined by many changing, often interdependent variables whose influence is unpredictable (JJ Boonstra). In the book the power of stories and art is explored as sources of inspiration and providing meaning to our work and the world. More books to read to change the world: visit our book page on Pinterest.